LOS ANGELES – Feb. 19, 2016 – Callaway Cars executives unveiled their new 610 horsepower 2016 Callaway Camaro to members of the automotive media and enthusiast VIPs on Feb. 18, 2016. Debuting at a private reception at Callaway’s Santa Ana, California factory, the SC610 displayed a number of technical accomplishments engineered by Callaway and integrated into the new Camaro platform. During the introduction, the Callaway team explained how the 2016 Callaway Camaro SC610 came into being. 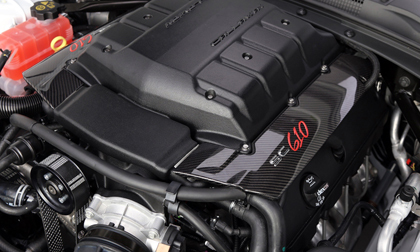 The patented GenThree supercharger system is the heart of the Callaway Camaro SC610 package. Its 2300cc Eaton TVS rotor pack is configured to force air upward into the supercharger housing. Power-robbing heat, inherently produced by supercharging, is removed from the charge air via convective cooling, as it flows through the supercharger housing. This effect is amplified by extending the housing through the hood, exposing it to ambient temperature. Conductive heat transfer is also utilized as the TripleCooled™ intercooler system includes one main and two additional intercooler elements, conducting heat from the charge air. The result is consistent power – lap-after-lap at the track or run-after-run at the dragstrip. The Callaway Camaro SC610 package also includes a Callaway air inlet system to further improve performance. To distinguish the Callaway Camaro SC610, Callaway carbon fiber engine mid covers, an under hood build plaque with VIN, interior and exterior badging, door sill panels, and embroidered floor mats are included as standard equipment. Each Callaway Camaro SC610 comes with an authenticity documentation package as well. Callaway Camaro SC610 engine management calibration provides excellent road car drivability with emission compliance in all 50 states. A standard 3 year/36,000 mile (60,000 km) Limited Warranty is included and an optional 5 year/60,000 Limited Powertrain Service Contract is also available, concurrent with the GM powertrain warranty term. The Callaway Camaro SC610 is available with automatic or manual transmission, as a coupe or convertible, through a network of Callaway Authorized Dealers. In addition, Callaway factory salespeople can be contacted to assist prospects through the purchasing process. Callaway Camaro SC610 MSRP starts at $54,290 (including the base Camaro SS), or at $16,995 as an option on the automobile. Callaway cars are specialist models, built on demand, with retail financing and warranty coverage. They are sold as new cars through selected GM Dealerships. Callaway cars and trucks are assembled to precise engineering specifications by expert technicians at Callaway facilities, exclusively. In addition, Callaway provides the most comprehensive standard warranty among all specialty manufacturers. Headquartered in Old Lyme, Connecticut, Callaway Cars is a global leader in the manufacturing of specialty vehicles and performance products. Founded and led by Reeves Callaway and Mike Zoner since 1976, Callaway Cars has achieved significant success in performance engineering for street and motorsport applications. Technological sophistication, design artistry and craftsmanship are hallmarks of the company’s vehicles and products. Other companies under Callaway ownership include Callaway Carbon, which produces high value composite parts for aerospace and defense, Callaway Engineering, which delivers a full range of contract engineering and manufacturing services and Callaway Competition, which campaigns one of the most successful GT3 race teams in FIA history. Callaway Competition develops and supports Corvette racecars for national and international series around the world. Authorized by GM, Callaway Competition GmbH is the exclusive constructor of the Corvette C7 for GT3 competition outside of North America. For more information, visit www.CallawayCars.com or call (860) 434 9002.